The SharePoint Patterns and Practices (PnP) reference implementation shows how you can use SharePoint webhooks in your application. The webhooks are implemented in an enterprise ready manner using various Microsoft Azure components such as Azure Web Jobs, Azure SQL Server, and Azure Storage Queues for asynchronous web job notification handling. The reference implementation only works with SharePoint list webhooks. Applies to Office 365 Multi Tenant (MT). Microsoft Azure is used to host the various components needed to implement Azure webhooks. An Office 365 Azure AD application, which can be found in the SharePoint developer samples GitHub repository. The application shows you how to manage webhooks, specifically for a SharePoint list. It also contains a reference implementation of a webhook service endpoint that you can reuse in your webhook projects. The SharePoint web hooks reference implementation deployment guide lists the deployment steps used to deploy the SharePoint provider-hosted reference implementation. 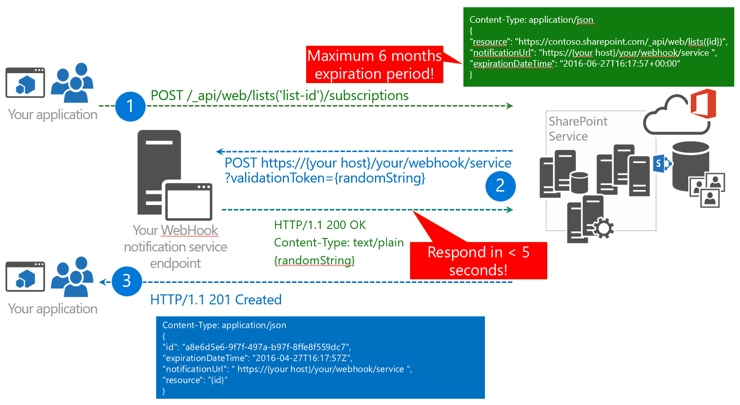 To deploy the Office 365 Azure AD application, use the steps described at SharePoint web hooks Azure AD reference implementation deployment guide, which shows you how to use a Web API function as webhook service. If you're more interested in using Azure Functions, see the Azure Functions guide for more details on how to use Azure Functions in this reference implementation. Webhooks notify your application about changes in SharePoint that the application needs to monitor. There's no need for your application to regularly poll for changes anymore. With webhooks, your application is notified (push model) whenever there's a change. Webhooks are not specific to Microsoft. They are a universal web standard that's also being adopted by other vendors (for example, WordPress, GitHub, MailChimp, and others). A payload that identifies the list that you're adding the webhook for. The location of your webhook service URL to send the notifications. The expiration date of the webhook. After you've requested SharePoint to add your webhook, SharePoint validates that your webhook service endpoint exists. It sends a validation string to your service endpoint. SharePoint expects that your service endpoint returns the validation string within 5 seconds. If this process fails, the webhook creation is canceled. If you've deployed your service, this works and SharePoint returns an HTTP 201 message on the POST request that the application initially sent. The payload in the response contains the ID of the new webhook subscription. The ID of the webhook subscription. If you want to update the webhook subscription (for example, you prolong the webhook expiration), you need this ID. The ID of the list for which the change happened. The server relative URL of the site holding the resource for which the change happened. SharePoint only sends a notification that a change happened, but the notification does not include what actually changed. Because you get information about the web and list that were changed, this means that you can use the same service endpoint to handle webhook events from multiple sites and lists. When your service is called, it's important that your service replies with an HTTP 200 message in under 5 seconds. Later in this article you'll learn more about the response time, but essentially this requires that you asynchronously handle the notifications. In this reference implementation, you'll do this by using Azure Web Jobs and Azure Storage Queues. In the previous step, your service endpoint was called, but SharePoint only provided information about where the change happened, not what actually changed. To understand what was changed, you'll need to use the SharePoint GetChanges() API, as shown in the following image. You can learn more about the GetChanges() implementation in the ProcessNotification method in the ChangeManager class of the SharePoint.WebHooks.Common project. To avoid getting the same change repeatedly, it's important that you inform SharePoint from which point you want the changes. This is done by passing a changeToken, which also implies that your service endpoint needs to persist the last used changeToken so that it can be used the next time the service endpoint is called. SharePoint does not call your service in real-time: when a change happens on a list that has a webhook, SharePoint queues a webhook callout. Once each minute, this queue is read and the appropriate service endpoints are called. This batching of requests is important. For example, if a bulk upload of 1000 records occurred at once, batching prevents SharePoint from calling your endpoint 1000 times. So your endpoint is only called once, but when you call the GetChanges() method, you get 1000 change events that you need to process. To guarantee an immediate response, regardless of the number of changes there, it's important that the workload of your service endpoint runs asynchronously. In the reference implementation, we leveraged the power of Azure: the service serializes the incoming payload and stores it in an Azure Storage queue while there's an Azure web job that runs continuously and checks for messages in the queue. When there are messages in the queue, the web job processes them and also executes your logic asynchronously. The following diagram describes the complete end-to-end webhook flow. Your application creates a webhook subscription. When it does, it gets the current changeToken from the list it created the webhook for. Your application persists the changeToken in a persistent storage, such as SQL Azure in this case. A change in SharePoint occurs, and SharePoint calls your service endpoint. Your service endpoint serializes the notification request and stores it in a storage queue. Your web job sees the message in the queue and starts your message processing logic. Your message processing logic retrieves the last used change token from the persistent storage. Your message processing logic uses the GetChanges()API to determine what changed. The returned changes are processed and now your application performs what it needs to do based on the changes. Finally, the application persists the last retrieved changeToken so that next time it does not receive changes that were already processed. Webhook subscriptions are set to expire 6 months by default or at the specified date when they are created. Often you need the webhook to be available for a longer time. The patterns described in the following sections are good for increasing the lifetime of a webhook subscription. The first pattern is lightweight and the second one is slightly more complex and requires an additional web job to be hosted. When your service receives a notification, it also gets information about the subscription lifetime. If the subscription is about to expire, inside your notification processing logic you simply extend the lifetime of the subscription. This model is implemented in this reference implementation and works fine for most cases. However, in a case where there's no change for 6 months on the list that you've created a webhook subscription for, the webhook subscription is never prolonged and is deleted. Create a web job that on a weekly basis reads all the subscription IDs from the persistent storage. One-by-one extend the found subscriptions each time. This web job is not part of this reference implementation. The actual renewal of a SharePoint list webhook can be done by using a PATCH /_api/web/lists('list-id')/subscriptions(‘subscriptionID’) REST call. In the reference implementation, updating of webhooks is implemented in the WebHookManager class of the SharePoint.WebHooks.Common project. During initial development, you provide your own serialized payload to your service processing logic. This makes it possible to completely test your processing logic without deploying the service endpoint (and even without configuring a webhook). If you have access to Azure resources, you can deploy your endpoint to Azure by using a debug build and configuring the Azure App Service for debugging. This allows you to set a remote breakpoint and do remote debugging using Visual Studio. If you do not want to deploy your service during development time, you need to use a secure tunnel for your service. The idea is that you tell SharePoint that the notification service is located on a shared public endpoint. In the client, you install a component that connects to that shared public service, and whenever a call is made to the public endpoint, the client component is notified and it pushes the payload to your service running on localhost. ngrok is an implementation of such a secure tunnel tool that you can use to debug your webhook service locally.